In September, the Idox Information Service moved into our new home. 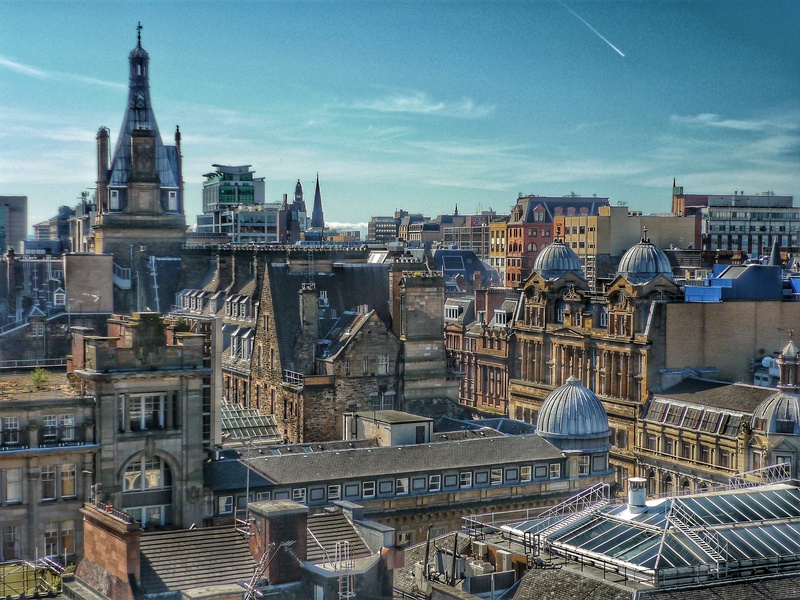 Along with our colleagues in the wider Idox Group, we relocated from the Scottish Legal Life Assurance Building in Glasgow’s Bothwell Street to the Grosvenor Building in Gordon Street, just a few blocks away. If our previous office could be described in terms of “Grand Designs”, our new workplace is definitely about “location, location, location”. Situated directly opposite Glasgow Central Station, the Grosvenor Building really is in the middle of things. And, just like our previous home, our new Glasgow office has an interesting and distinguished history. It was designed by one of Britain’s greatest architects – Alexander Thomson (often referred to as “Greek” Thomson because of his signature Graeco-Egyptian style). The site was originally occupied by the Gordon Street United Presbyterian Church. In 1859, Alexander Thomson and his brother George persuaded the congregation to sell the church, and in its place they built a commercial property, with street-level shops and a warehouse on the upper floor. 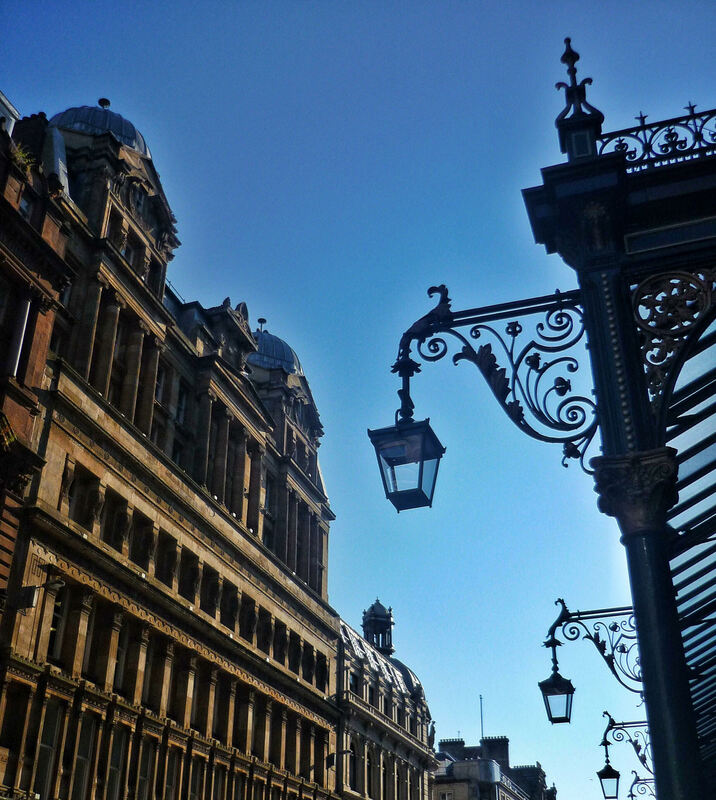 The building’s façade bears the hallmarks of a “Greek” Thomson original, with his familiar ornate columns on the lower storeys. It was completed in 1861, but three years later, the warehouse caught fire and had to be rebuilt. After another fire, in 1901, the building was restored, but this time with a new superstructure on top of the existing warehouse. This extension, designed by James Craigie, continued the classical theme, with elongated columns and twin baroque domes. But while some regard the additional layer as complementing Thomson’s theme, more critical observers believe that it detracts from his original vision. The extension, however, was to become one of the most sophisticated meeting places in Glasgow. With a magnificent marble staircase sweeping up to a stylish restaurant, and function rooms containing stained glass windows and crystal chandeliers, The Grosvenor (which gave the building its present name) was a place to see and be seen. Later, when the staircase was removed, many couples who had celebrated their wedding receptions at The Grosvenor, bought up pieces of the marble as souvenirs. Yet another fire, in 1967, put an end to fine dining at The Grosvenor, and for many years the building lay empty. Today, after an extensive refurbishment, The Grosvenor building is home to a suite of modern offices, although it retains its classical façade. 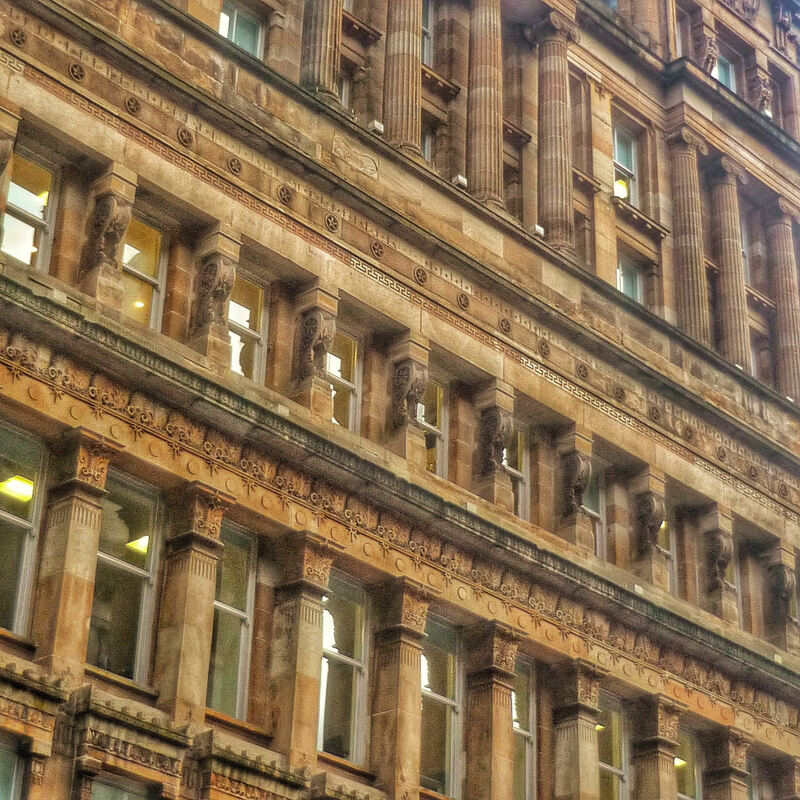 A fine building in its own right, The Grosvenor also has some elegant architectural neighbours, including the Grand Central Hotel, the Ca’D’Oro and another of Alexander Thomson’s masterpieces – the Egyptian Halls. For a long time after his death in 1875, Thomson’s work was neglected, and even today the future of the Egyptian Halls remains in doubt. Elsewhere, both in Glasgow and beyond, “Greek” Thomson is becoming almost as well-known as that other celebrated Glaswegian architect, Charles Rennie Mackintosh. And it’s worth noting that the money raised from the sale of the Gordon Street site in 1859 went on to fund one of Alexander Thomson’s greatest buildings – the St Vincent Street Church. It’s good to know that Alexander Thomson’s legacy is being preserved in The Grosvenor Building, and that the latest chapter in the story of Idox will be written into Glasgow’s architectural and social history. 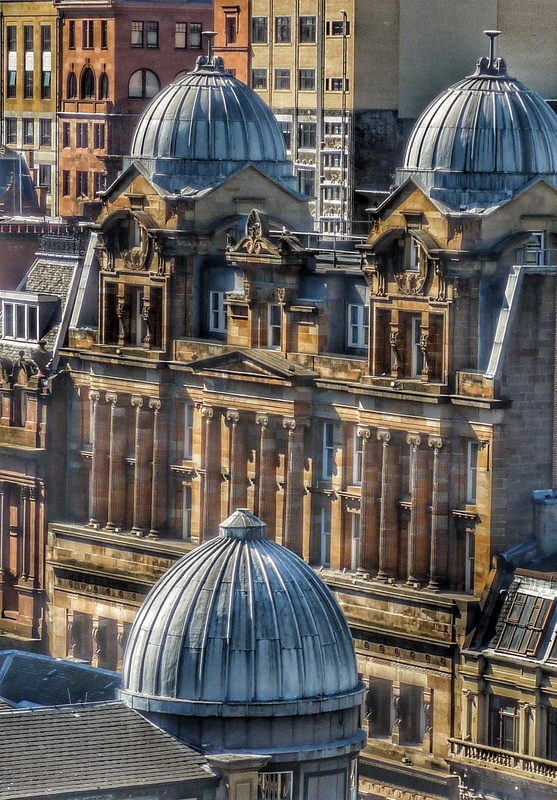 This entry was posted in Arts, culture and leisure, Business and economy, Planning, development and property and tagged Alexander Thomson, glasgow, Greek Thomson, Grosvenor Building, idox, Idox Group, idox information service, James Craigie. Bookmark the permalink. Just splendid, really splendid, to see the re-use of a priceless example of a facade reproduction of the Alexander ‘Greek’ Thomson style. Thomson has long been in the shadow of Glasgow’s other, later, architect. However, a rediscovery and recognition of Thomson’s work is now well under way – internationally as well as in his homeland Scotland.